Today is one of those days for me when I feel happy for no particular reason. This despite it being a cold and rainy day. Not that I am complaining; I generally feel content and pleased with my simple life. To keep up the great mood I was in I had to eat something light, colourful and quick. So, I settled for the bright and colourful corn and bean salad. I read somewhere that beans are rich in selenium, which is known to be a major mood uplifter. How cool! This besides being a great looking salad, is also quite nutritious. It contains a good amount of fibre, proteins, vitamins and antioxidants from the different ingredients. This tasty and colourful salad comes with a spicy dressing, and is a perfect light lunch or side. You could make this salad ahead in glass jars and carry it with you for a lunch on-the-go. In a small mixing bowl, add the ingredients under ‘For the dressing’. Give it all a good mix and keep aside. Steam corn kernels. I steamed it in a microwave oven for 1 minute with a dash of water. Whether you use canned or soaked and cooked kidney beans, make sure the water is completely drained. Slice the onions and tomatoes thinly. 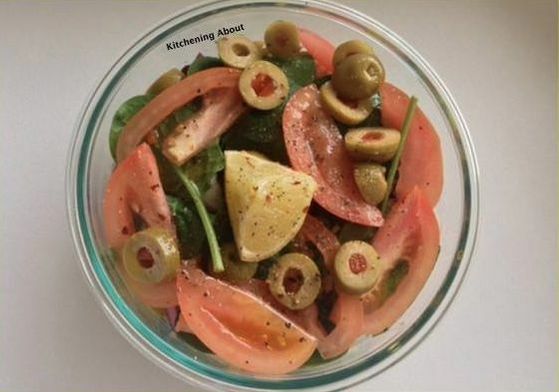 In a large bowl, layer the corn kernels, kidney beans, olives, onions, tomatoes and salad greens. Note: If you are taking this salad to-go, pour the dressing on the top and mix it just before you intend to eat it. Always remember to keep the leafy greens and soft ingredients on the top. I had kidney beans in hand. Replace it with other beans or mixed bean varieties of your choice. I did not use cheese, you could opt to add it. Feta and haloumi make a great addition. You could add cooked rice, cous cous, quinoa or millets in the salad for a complete meal.